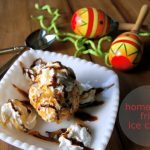 Homemade Fried Ice Cream | NoBiggie.net | So technically it’s not fried, but it’s the best at home version without the fryer. You’ll love it! I’m such a sucker for fried ice cream. It’s so good! I always have to order it at my favorite ‘dive-y’ Mexican spot. It’s so simple and inexpensive to make that I had to try to master it at home. clear plastic gloves it gets messy! 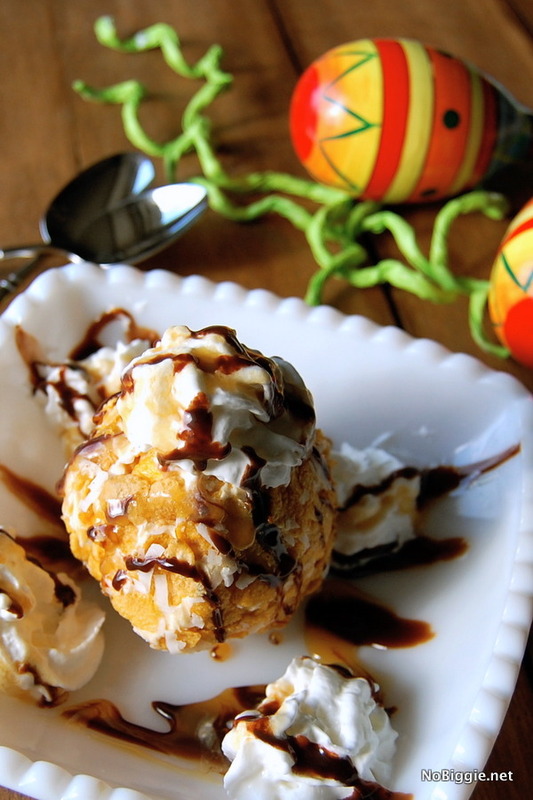 To make fried ice cream put your clear plastic gloves on, scoop out a big ball of vanilla ice cream roll it around in cinnamon then wrap it up in plastic wrap and store it in a big plastic bowl until you are ready to serve. When ready to serve drizzle a little caramel syrup on the ice cream ball and then roll the ball in the cornflake/coconut/cinnamon mixture. Serve with more caramel syrup, chocolate syrup and whipped cream. *My first attempt at this didn’t go that great, and the problem was that I froze the ice cream balls with the cornflake mixture on it. 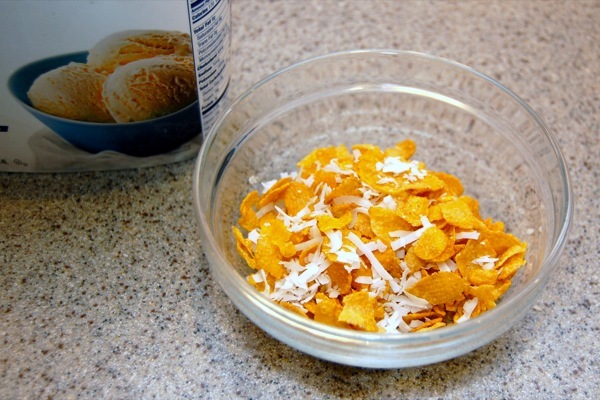 The cornflakes can lose their crunchy texture in the freezer…And that’s the best part! Looks so yummy! And so easy to make! Why are we going out for Indian food on Cinco Di Mayo???? Happy Anniversary this week. I know! What are we thinking?! Wait a minute… so you don’t really even “fry” these? Very nice!! Looks delicious! Nope! I know…I thought the same thing, but the kind I LOVE, they don’t fry them either. Wow, Kami! This looks devine! 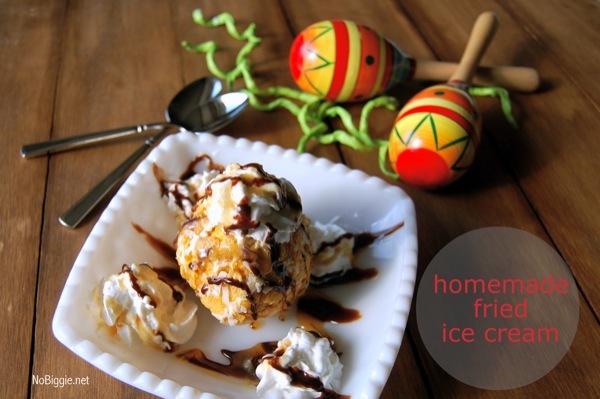 Growing up in Phoenix, I’ve had my share of Mexican Food and that includes Fried Ice Cream and have always wanted to try and make it. Thank you for sharing the recipe!! Wow- that’s a lot simpler than I thought it would be! I’m definitely going to try it! What the what?! YUM-O. I’m gonna have to do this stat!!! looks totally yummy!! thank you for sharing the recipe … a yummy project for the weekend with my little ones. Hugs! Sooo good! Just one little change…I use Cinnamon Toast Crunch in place of the Cornflakes. Cinnomany goodness!